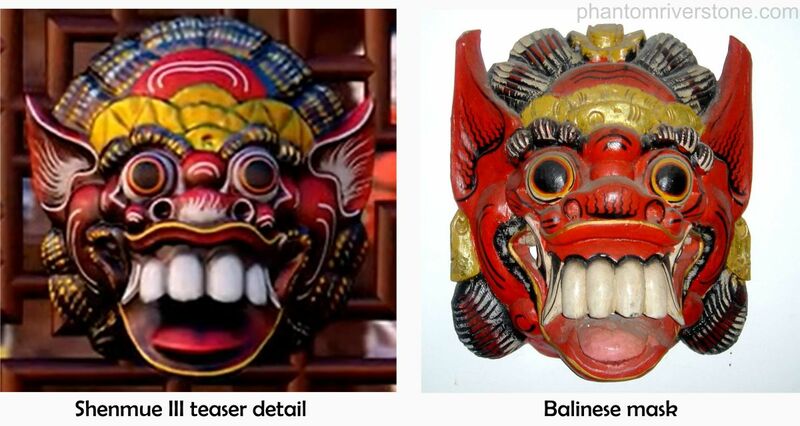 The bulging eyes and protruding fangs depict the demon queen Rangda from traditional Balinese mythology. This is one of several styles of mask used in traditional dance performances. Tall vases line the wall of a ceramics shop, and a line of large ceramic plates gleams in the evening sun. In the foreground we see a blue Chinese teaset, on which Chinese characters are written. The Chinese characters on the sides are part of a four-character phrase, Wan Shou Wu Jiang (萬 壽 無 疆), that represents an imperial birthday wish. This phrase was reserved for the birthdays of the emperors and empresses of China, and translates as "boundless longevity" or "everlasting long life", where Wan = 10,000, Shou = long life and Wu Jiang = without boundary (source). This phrase has appeared in porcelain decorations since the late Qing period in the 1800s and remains popular as a decoration today. 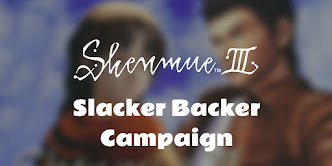 In the teaser we get to see Ryo engaged in hand-to-hand fighting as he exchanges a flurry of blows and parries with the muscly character in red suspenders who was introduced in an earlier Kickstarter update. Ryo spars with an enemy. Of particular interest is the location in which this fight is taking place. 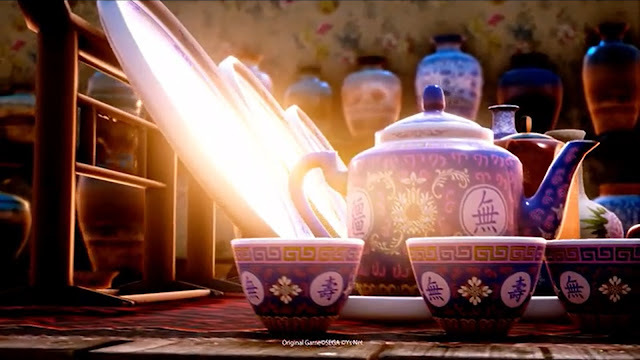 Judging from things like the lighting, the cobblestones, and the shape of the archway, sharp-eyed fans have identified that this fight is taking place inside the square structure that can be seen on the fortified wall from the promotional shot below. All those elements certainly seem to match. Plus - Ryo's character model has previously been spotted lurking inside the structure in the still image (based on the teaser, he may not have been at true scale), which does suggest that he will visit this location at some point. The "Great Wall" promotional image. The newly-rendered Phoenix mirror as seen in the teaser looks superb. Viewing it side-by-side with its former appearance on the Dreamcast, the increase in fidelity is marked. In the April 2016 Kickstarter update video, graphic artist Manabu Takimoto was shown working on the concept art of a scene. The same scene was visible on a monitor at a Shenmue III meeting, in an image that was posted up onto the Shibuya Productions Facebook page in June 2016 by co-producer Cédric Biscay. 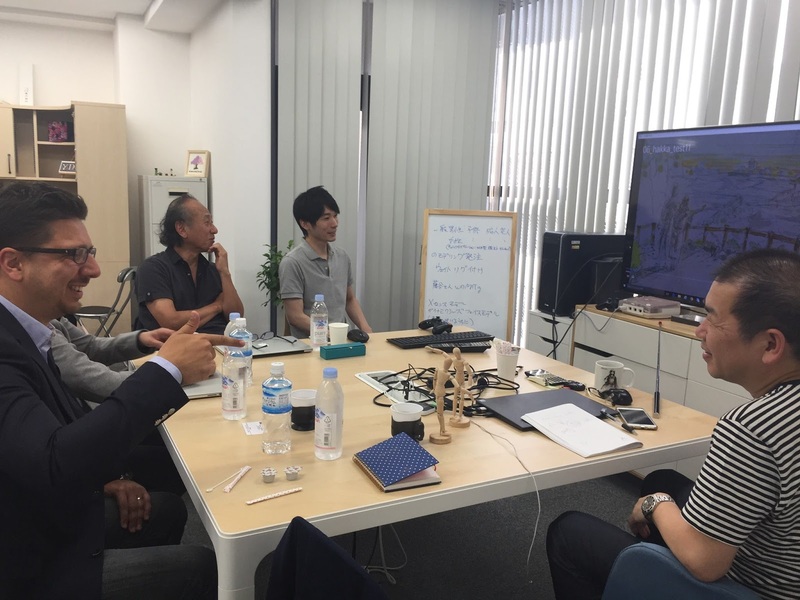 The same scene on a monitor at a Shenmue III meeting (June 2016). With the release of the trailer, we at last get to see the fully-rendered scene. 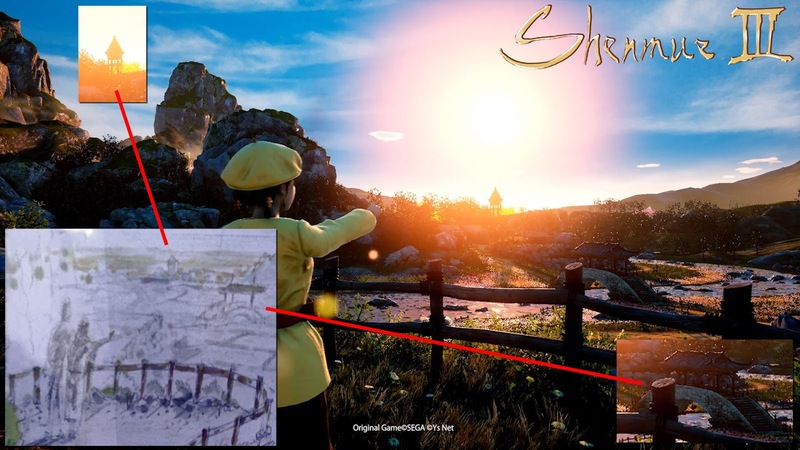 The characters can now been confirmed as Ryo and Shenhua, who is pointing in the direction of a watch tower at what can be assumed to be Bailu village. 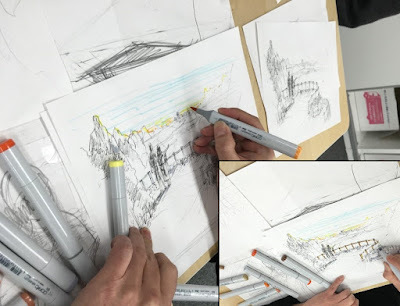 A bridge spanning the river can also be recognized from the concept art. The concept art come to life (Ryo is about to enter the frame). 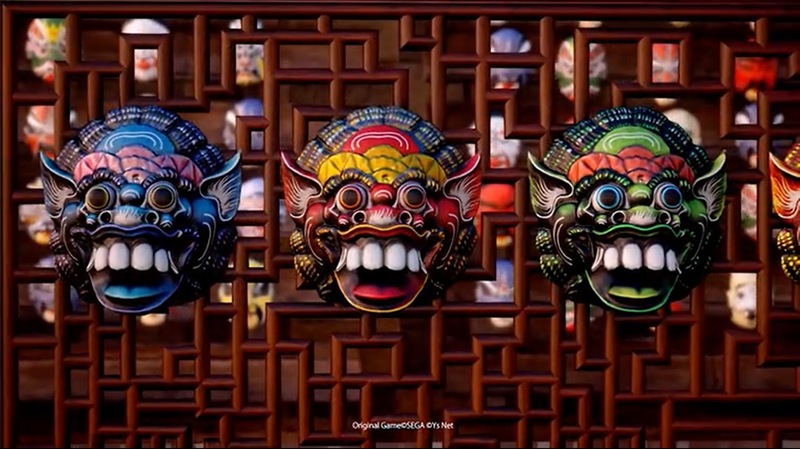 In Shenmue II, an exciting action cut-scene occurs in Guilin soon after Ryo arrives. Following heavy rain, he spots Shenhua in trouble in the swollen river and plunges in after her, only to later learn that she had jumped in deliberately to try to rescue a white fawn. 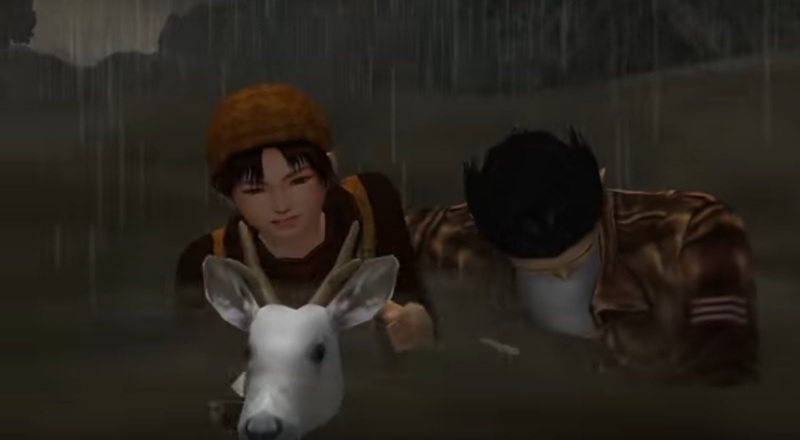 Ryo rescuing Shenhua rescuing a white fawn. After thanking Ryo for saving them, Shenhua explains that the white deer is the guardian of her village, and that her village's name, Bailu, means "white deer". In the teaser, although only visible for a split-second, a similar pair of horns and ears can be glimpsed next to Shenhua outside her house. Shenhua sitting outside her house, with a friend (bottom-left). I found the following brief scene amusing. It shows Shenhua and Ryo hurrying towards each other. Once they get close, Ryo comes to an abrupt stop and seems to back off a step. I love the way Ryo's body language here captures his slight awkwardness at getting too close to Shenhua, reflecting the way he handles his relationships with people in general. 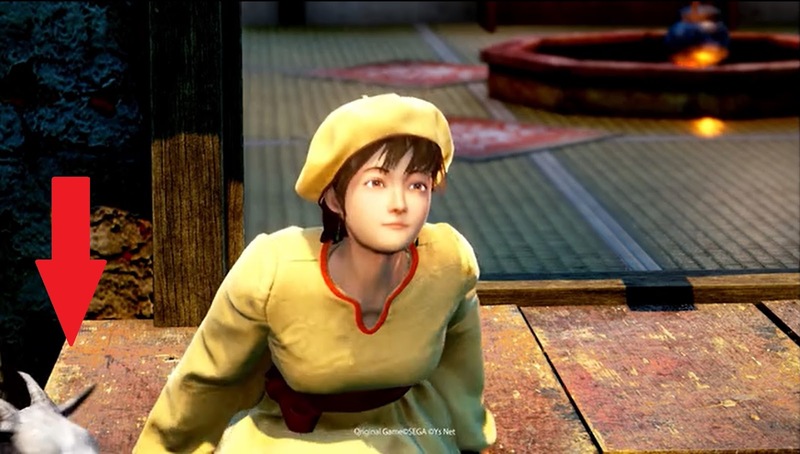 It's is a good indication that Yu Suzuki will be including these kind of subtle scenes to portray their changing relationship throughout the game. These were a selection of elements from the teaser video that may not have been obvious on a single brief viewing. 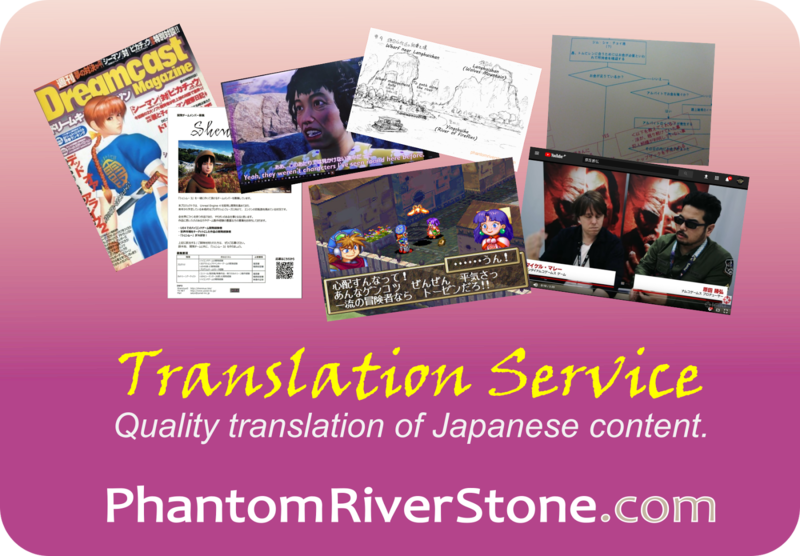 If you have noticed other things of interest, as always please share them in the comments! 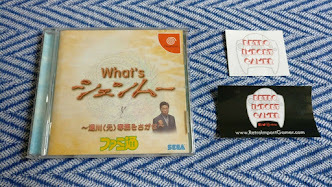 It's the kind of attention to detail that I loved in the first two Shenmue games.